We are indeed living in magical times. Topics explored by the Sci-Fi masters of old are becoming reality. Flipping through your favorite futuristic novel on your digital device while your living room’s temperature is automatically adjusted by sensors is proof of that. But it doesn’t stop there. The steady and rapid advancement of technology isn’t only changing our personal lives, the way entire urban areas operate is becoming smarter. 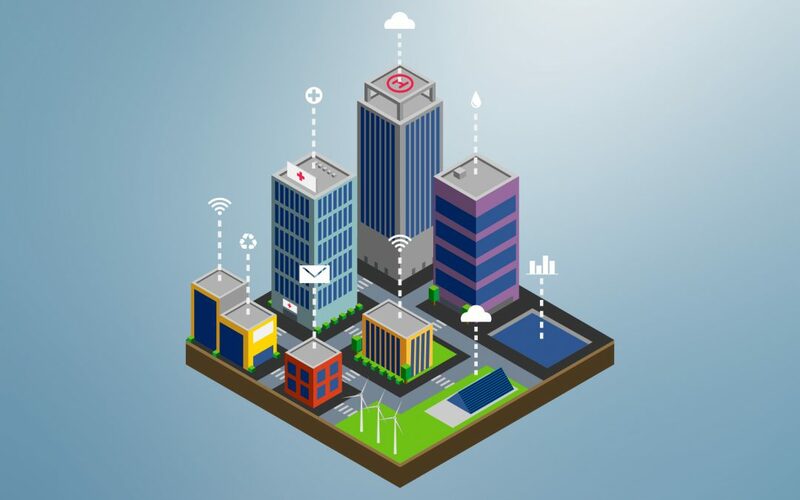 In its white paper entitled Smart Cities and Communities, Del Inc. very appropriately describes the idea behind smart cities as a means to leverage digital technologies to better manage user expectations, optimize and better allocate their resources, provide a safer and more sustainable environment, foster innovation, and give residents a personalized, always-on end-user experience. Why should cities become smarter? According to the MIT Media Lab City Science Initiative, cities will soon account for 90% of population growth, 80% of global CO2 emissions, and 75% of energy consumption. These are alarming stats as far as the environment and social well-being go. Consequently, many local authorities are looking at smart city projects from the perspective of waste reduction, cost and energy conservation, traffic optimization, etc. In Smart Cities and Smart Living: The Role of Telecom Operators, Steve Bell, Senior Analyst at Heavy Reading, mentions that the four main drivers of smart city development are urbanization, greenhouse gas reduction, digitalization and the Internet of Things. At the end of the day, it concerns an evolutionary process that is key to ensuring smarter healthcare, smarter education, smarter mobility, smarter public safety, and smarter infrastructure. So where to start? Top experts agree that the creation of smart cities begins with perfecting smart buildings. Making a building smart involves facilitating an ecosystem which connects power, lighting, heating, etc. with sensors and control systems. These adjust the building’s settings according to real-time usage patterns, resulting in energy savings, improved air quality, and an increase in overall efficiency that can later be applied on a much larger scale, ergo smart cities. Navigant Research estimates that smart building technology will produce a global revenue of $8.5 billion in 2020, which indicates that the ball has certainly begun to roll in this direction. Hence, governments and private organizations worldwide are investing in the deployment of IoT-style technology that will help automate new and old buildings alike. Joan, our own smart booking solution, is a nice example of how implementing hi-tech in offices can substantially cut energy and material costs down to a fraction as well as increase productivity. Moreover, E-paper based technology used with this room booking system is merely scratching the surface. Joan is already glimpsing beyond the walls of a smart building and leaping into new ways of how it can help digitalize various aspects of a smart city’s infrastructure. Due to their low energy consumption, e-paper devices are already being used to digitalize public transport. Back in 2016, Ljubljana, Joan’s home town, joined other cities heading down the smart path by implementing advanced passenger information displays. A much smoother, greener option. Similar sustainable displays can be used in the future in a number of public and private sectors, thus lowering electricity usage, reducing light pollution, and most importantly, sending a message that smart technology is the right choice in preserving our environment within urban areas. Creating a data-driven ecosystem by incorporating disruptive, smart technologies where it counts has already proven its worth in increasing public connectivity, social safety, improving convenience, and acting as an indispensable deterrent against climate change. With the right political backing, education and careful planning, smart cities are destined to transform the way we live, work and coexist. A brave new world without the Orwellian factor? Yes, please.